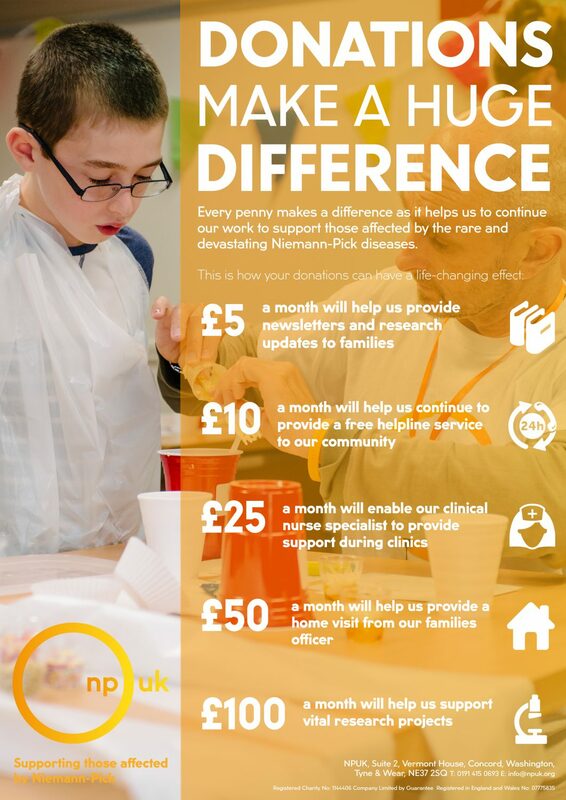 NPUK relies entirely on voluntary donations and fundraising to enable us to continue our work in supporting the children, adults, and families that are affected by Niemann-Pick disease. We’ve only been able to achieve what we have thanks to the voluntary donations and fundraising efforts of people like you. However, we know we can achieve much more so please continue to support us in any way you can – your kindness will help change lives. If you live in the UK you can donate to NPUK easily from your mobile phone – simply text: NPUK02 followed by the amount you’d like to donate to 70070. For example e.g. “NPUK02 £5” to 70070 (UK ONLY). These donations are handled by our Just Giving account, and go directly into our fundraising account. You can also donate to our Virgin Money Giving and Just Giving accounts online. Thank you from everyone here are NPUK!